Last week my classmate Rachel and I had the opportunity to go to a school to teach students about Halloween. We had absolutely no idea what to expect. We only knew that carving pumpkins was part of the plan, and Rachel and I were very excited. We entered a classroom filled with about thirty students. All sixty eyes were staring at this gigantic plump pumpkin in the front of the room. As much as I want to say that Rachel and I were excited, the students were ecstatic and anxiously awaiting to see what would happen to the pumpkin. David, the man in charge, began to explain to the students that Rachel and I were going to carve the pumpkin. The students were in charge to come up with ultimate scary design. Before they began their design, Rachel and I explained that in America we remove the seeds of the pumpkin so we can make pumpkin pie. We carve the pumpkins in to scary faces and leave them outside. Thus, when children are trick or treating they can see the lit up pumpkins and it adds to the Halloween feel. Rachel and I began to carve the pumpkin. We started with the top, and removed the insides. The students were intrigued as we grabbed the gooey brains of the pumpkin. Rachel even brought around chunks of it for the students to touch. Students would hesitate to touch the insides, terrified that it would jump back at them. It was priceless to watch. When we had the pumpkin cleaned out, and the design in hand, Rachel began drawing on the face. We then carved out the design and placed a few lit candles in the pumpkin. 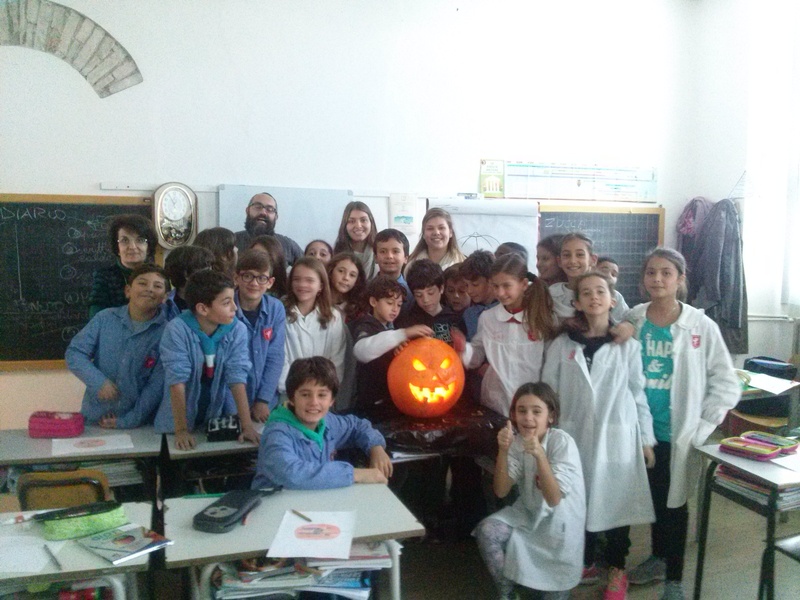 With the lights turned out in the classroom, the pumpkin lit up perfectly and the students all had wide grins to show for their approval. Rachel and I had succeeded. Even though we only spent an hour with the students, it was one of the best hours I’ve spent here in Perugia. This entry was posted in Class Journal and tagged Borgo Bello schools, Fall 2015. Bookmark the permalink.